On this coast it’s a well known fact that in a strong South Easterly both Amble & Whitby entrances can be dangerous, however the Columbian Bar seems to take the biscuit when it comes to scary ‘landings’! The video is of commercial fishing boats coming back from fishing off the coast of Washington and Oregon. They are crossing the Columbia Bar, which is where the Columbia River meets the Pacific Ocean and is designated as one of the most dangerous ports of entry anywhere in the world. There are 8 to 10 deaths per year caused by inexperienced Boaters attempting to go through this area. The boats are self-righting, super low center of gravity, sealed engine compartments, basically bullet proof glass windows, double steel hulls. The Coast Guard has closed the area in the past on occasion due to waves reaching 35 to 45 feet! This entry was posted in General Interest, Safety on April 30, 2013 by Rob Storrar. This entry was posted in General Interest, Events on April 30, 2013 by Rob Storrar. 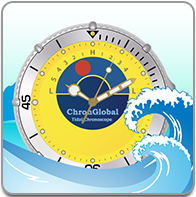 "The ChronGlobal Tidal Chronoscope works as a tide chart, tide graph and tide table, but in a wristwatch format. It provides an intuitive depiction of present and future tides for 9400+ USA and worldwide tide stations. Instantly, and at your very location. Along with lunar and solar positions, in the look and feel of the most popular tide watch ever." Just don't forget to keep the thing charged up... as I often do! This entry was posted in General Interest, New Products on April 29, 2013 by Rob Storrar. Was in a boatyard the other day installing a Harken furling system on a clients mast, was working alongside another mast where next to one of our customer who was installing a replacement Raymarine Radar and happened to notice that he had not fitted a plastic bush to protect the cable against chafe, pointed it out, his reply 'feed the new cable thru as per the old' What's that saying measure twice cut once! 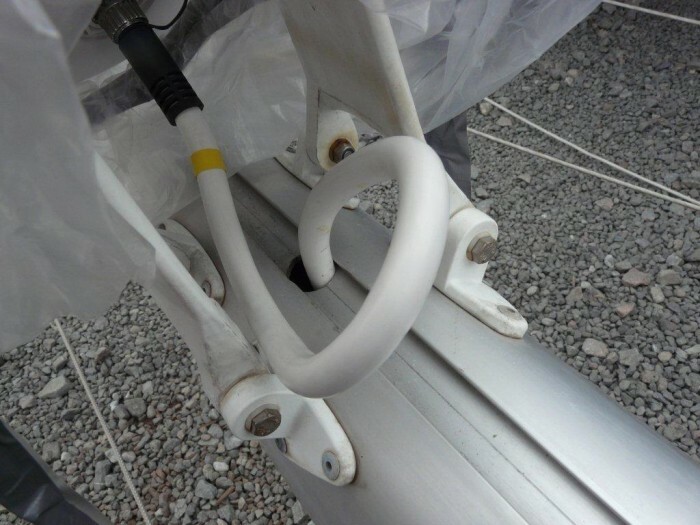 This entry was posted in General Interest, Safety, Tips and Advice and tagged Harken, Jabsco Toilet, Blakes Lavac on April 29, 2013 by Rob Storrar. We all know how annoying it is to be lying awake in your bunk at 3am and listening to the halyards slapping against the mast on your neighbours yacht, mind you, it’s even worse if it happens to be yours! Staking your halyards out is one way to overcome this, take your spinnaker, spare genoa halyard, if fitted and topping lift assuming you have a solid kicker over to the guard rails forward of the mast (but not next to the forestay) and the main halyard to the guard rail say 2mtrs aft of the mast. 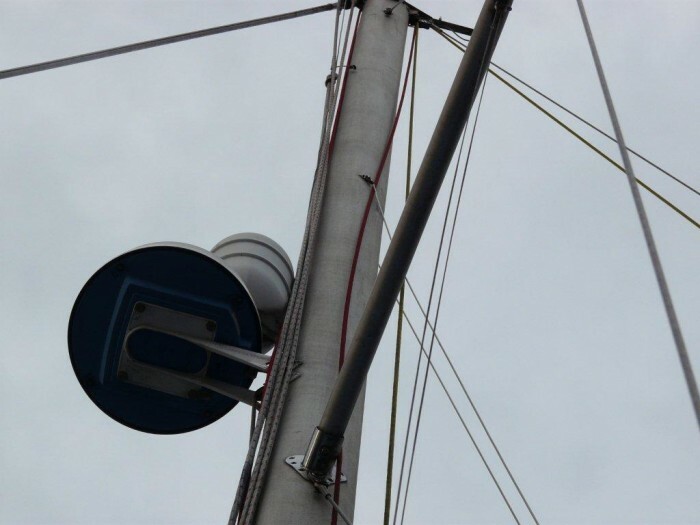 As well as getting a good night’s sleep you then keep the halyards away from spreaders and other mast fittings where chafing of the rope cover in windy weather could be an issue. The other way to get rid of the slap is to purchase a Frapper, at under £10-00 its excellent value for a good night’s sleep! While you are ‘thinking’ running rigging, we strongly recommend that after a day’s sailing you slacken off both your genoa and in mast reefing mainsail halyards and of course ease your backstay! 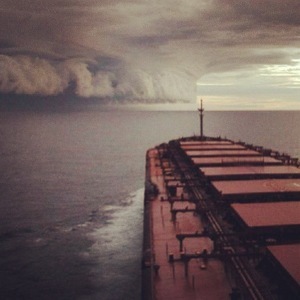 This entry was posted in Top Tips Tuesdays on April 24, 2013 by Rob Storrar. Universal Stone contains no phosphates, so as a cleaning product it has been given the thumbs up for use by the Windermere Cruising Association, has also been given the thumbs up by my good lady as she has got me using it all around the house, cleaning the grouting in our shower, performing miracle(s) on the ‘gloss’ paintwork on our front door, bringing back the sparkle to our UPVC windows, polishing the Arga etc etc! My tip for what it’s worth is not to make my mistake i.e. take it home and tell your better half how wonderful it is! 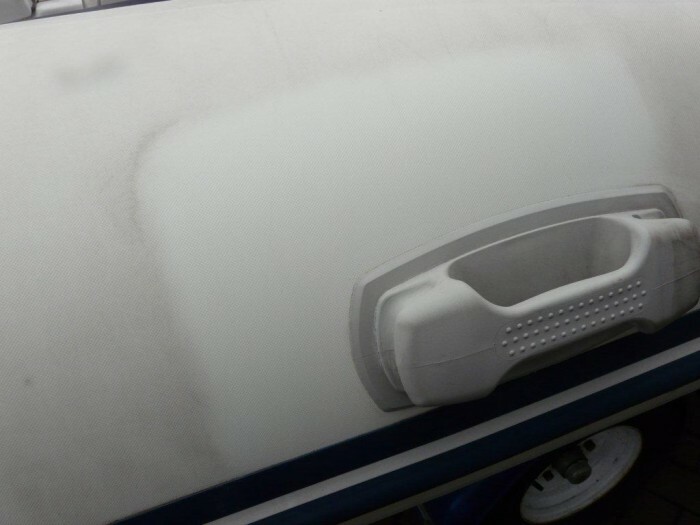 Cleaning a very grubby rib, Universal stone is the answer, rubber rubbing strake round a sugar chute transom comes up spotless, rust stains on gelcoat, scuffs on acrylic windows the list is endless! This entry was posted in General Interest, Tips and Advice, Products in the spotlight and tagged Universal Stone on April 23, 2013 by Rob Storrar. 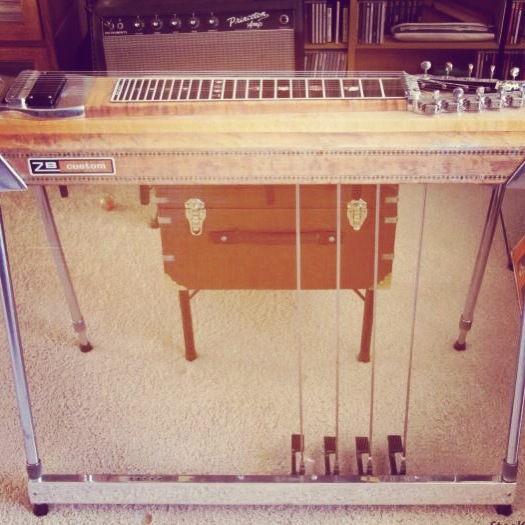 What does Storrar Marine Chandlery have in common with a ZB S-10 Pedal Guitar? Q. What have a nineteen seventies ZBS10 three pedal 10 string guitar and a state of the art all singing and dancing chandlery in the Newcastle area got in common? A. The Ultraflex ‘universal’ joint is stocked by ourselves and is used in most pedal guitars! This particular guitar which was ‘dispatched’ to an attic in the early eighties is now being restored using these Ultraflex components. This particular style of guitar has three ... on the two neck guitars there are 10 rods thus ten universals, nice business if you can get it! This entry was posted in General Interest and tagged Ultraflex on April 22, 2013 by Rob Storrar. Having done a few 'Chinese gybes' in my long past International 14 sailing career, I enjoyed (if that is the right word) the film footage of Sam Goodchild’s Chinese gybe! 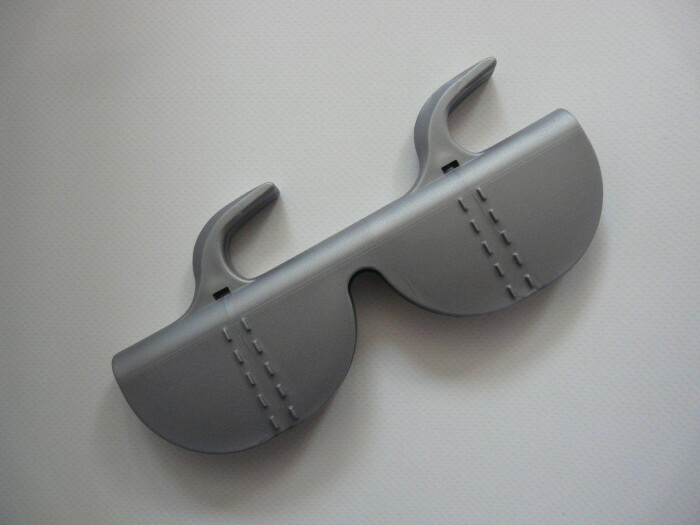 With the cruising season nearly upon us we are starting to get a few orders thru for gybe preventers. Both the Walder and the GYb’Easy Wichard Boom Brake get good write ups and are competitively priced, you pays your money and makes the choice! This entry was posted in News on April 19, 2013 by Rob Storrar. 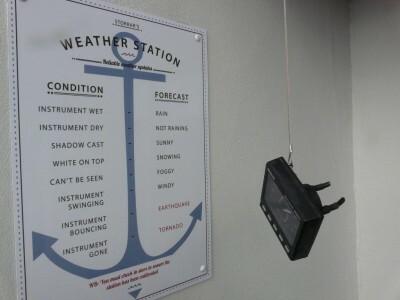 As I blogged on the 17th we survived the Tornado, sadly the electronic components within the weather station self destructed (as it was designed to do) however avid readers, ... you will be pleased to know that with a sterling effort from the 'techies' we have managed to install an ‘even more sensitive instrument'! With the wonders of wireless internet technology if you log onto www.storrarmarine.co.uk, scroll to the bottom of the home page and click on "forecast", there you'll instantly be transported to the latest local and regional weather updates, amazing! Incidentally our Skywatch range of handheld wind speed indicators do find themselves in all sorts of diverse locations, with 'elf 'n' saaafety being a priority these days construction firms are buying them if working aloft, commercial painters, chemical companies etc. This entry was posted in Safety, Tips and Advice, News and tagged Skywatch on April 18, 2013 by Rob Storrar. 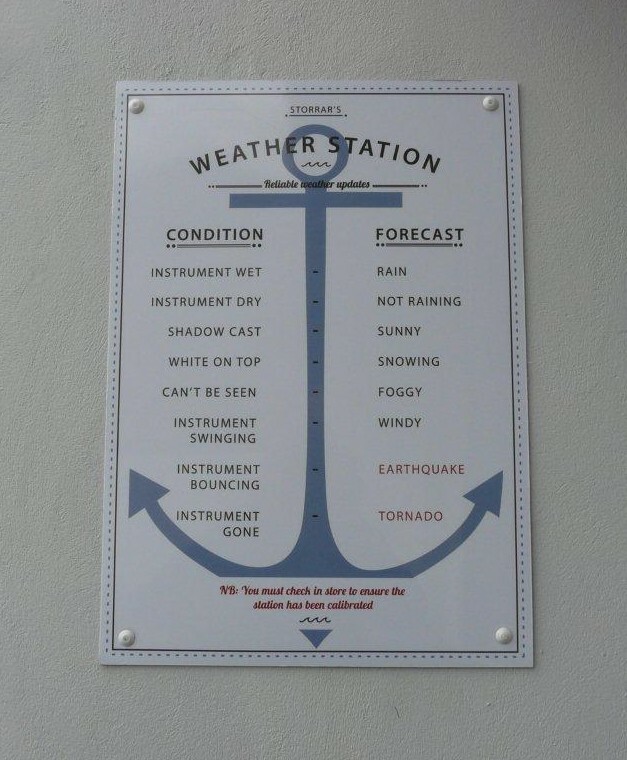 Installed just in time for the boating season our high tech weather station, which features a ‘state of the art’ B&G network wind instrument, did correctly forecast a Tornado Strike over 181 Coast Road! Andy Burgess the younger (but not so good looking) partner in the company was heard to say ‘well b... r me that was a geet big gust’ when the ceiling tiles started floating in our nerve centre, he immediately rushed outside and confirmed what he thought... yes a Tornado had struck and the forecasting device had vanished! Fortunately we did have a Nasa as well as an ICS Navtex in stock so all was not lost! This entry was posted in News and tagged ICS, NASA, B&G on April 17, 2013 by Rob Storrar.